Every once in a while I try a recipe that turns out so much better than I anticipated. It usually ends up being a recipe that I crave days, weeks, or even months after I make the dish. This is one of those meals, and it stunned me. Sure, I expected it to be tasty, but to be honest I was more focused on the health benefits when I decided to make these cakes. I didn’t expect the flavors to be so vibrant, the taste so fresh. And I had no idea that my family would love them as much as I did. I was drawn to this recipe the moment I read it. It is loaded with healthy ingredients that I generally keep on hand, contains Indian spices, and it’s in a tiny cake-form. That’s right, I’m not above making a dish because I like little cakes. Hey, they’re fun. Another nice aspect to this dish is that is works as both a side accompaniment to a larger meal, or as the centerpiece with a salad or fruit. Or how about this? Stuff a couple of the cakes into pita bread along with some fresh vegetables like cucumber, tomato, and red onion. Top with the sauce and it’s a perfect lunch to take to work, the park, or wherever you like. The extra cakes from the recipe keep very well and heat up easily without loosing any their wonderful texture. It really is a nice meal to make at the beginning of the week that you can come back to over several days. Just a note, you can roast a head of garlic for the raita (sauce). I decided to use fresh garlic in the sauce, and it was incredible. I substituted 2 cloves instead of the whole head, as fresh garlic is much more pungent. Also, the roasted garlic need not be mixed into the raita, but can be served on the side. To prepare the Raita: Toast the cumin seeds in a dry skillet for 2-3 minutes, or until golden brown and fragrant. Let cool. 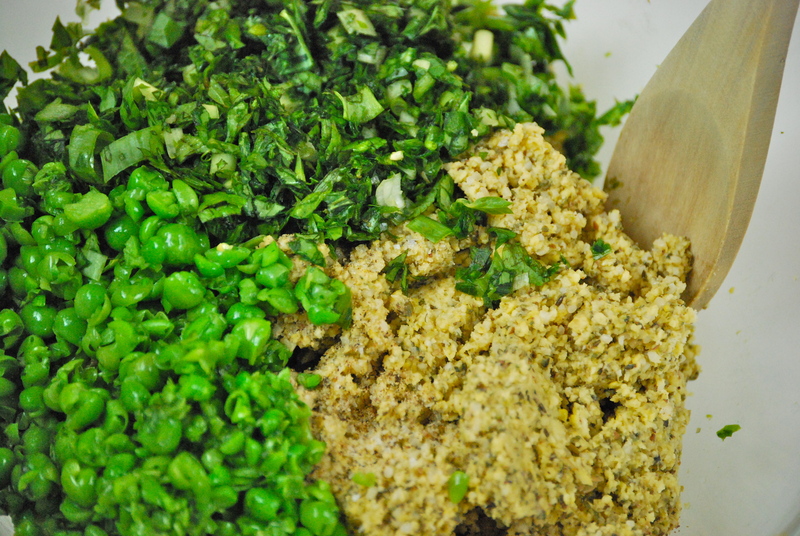 Pulverize with a mortar and pestle or finely crush with a sharp knife. Mix the yogurt, cucumber, cilantro, mint, jalapeno, cumin, and 1 teaspoon lemon juice. Season with salt and pepper. Set aside. 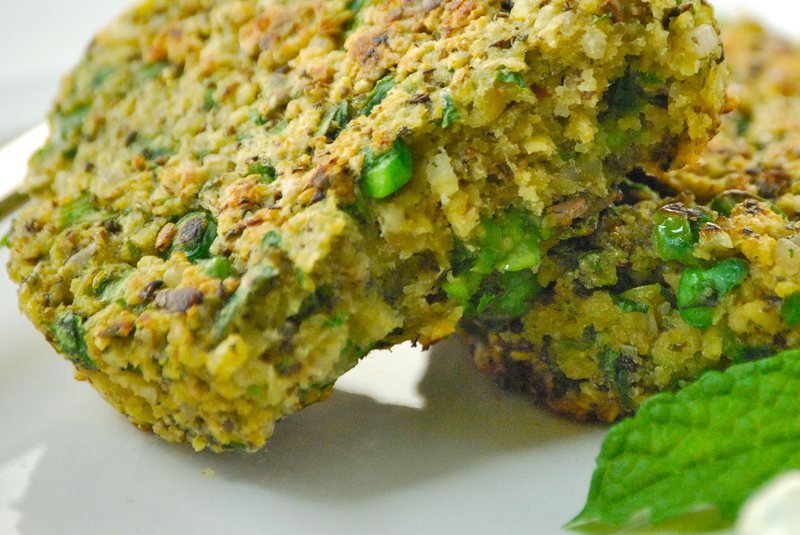 To prepare the lentil cakes: Rinse legumes; place in a medium bowl with rice and cover with 3-inches of water. Let mixture sit at room temperature for 3-5 hours. Drain mixture and transfer to a food processor. Add garlic, ginger, and jalapeno. Process until grainy paste forms (add 1-2 tablespoons water, if necessary). 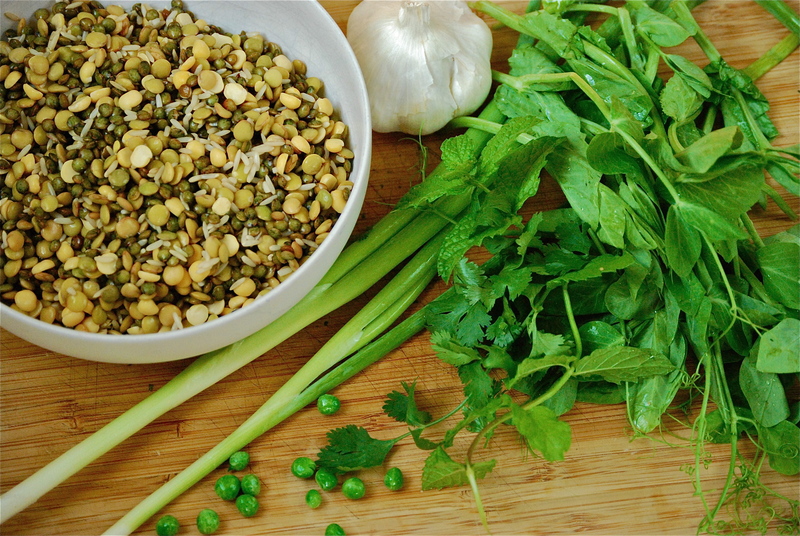 Transfer to a large bowl; mix in your choice of chopped greens, peas, cilantro, scallions, mint, salt and pepper. Heat 1 tablespoon of oil in a large skillet over medium-high heat. Fill a 1/4 cup measuring cup almost full and gently compress it. Tap mixture out onto your hands, careful to keep it’s shape and gently place into the hot skillet. Reduce heat to medium and saute until golden brown and cooked through, add 1 more tablespoon of oil (if necessary) and flip. Cook about 4-5 minutes per side, of whenever they are your desired color and doneness. Repeat with remaining oil and mixture. Top with raita — enjoy! Looks wonderful! Just making my market list. My stomach is telling me to go NOW!!! Thanks, Kristi. You’re going to love them! So I don’t need to cook the rice, just soaking is enough? I can imagine the crunch. This is interesting! That’s right, Tina — just soak the rice. Interesting, right?! It cooks enough when you brown it in the skillet. There won’t be a noticeable crunch at all. 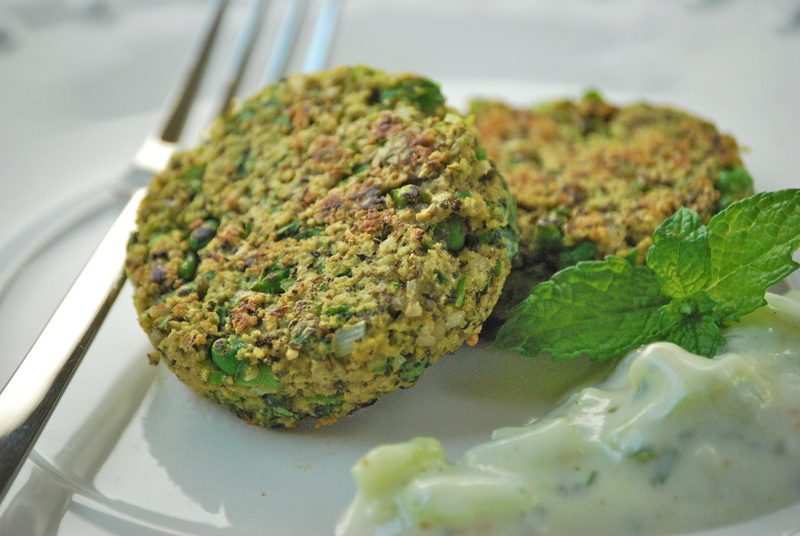 Such a beautiful Lentil Cakes with Raita. I loved it completely. It looks so delicious. Want to have it.